Despite tough fishing reported coming into the tournament, 16 limits were still brought to the scales including 14 fish over three pounds. Most importantly though, the tournament directors would like to thank all participants for their professional behavior after the tournament. In the presence of numerous spectators, including many children, no "adult" language was overheard. This set a positive example for the R & B Bass Circuit, but also bass fishing in general. THANK YOU! 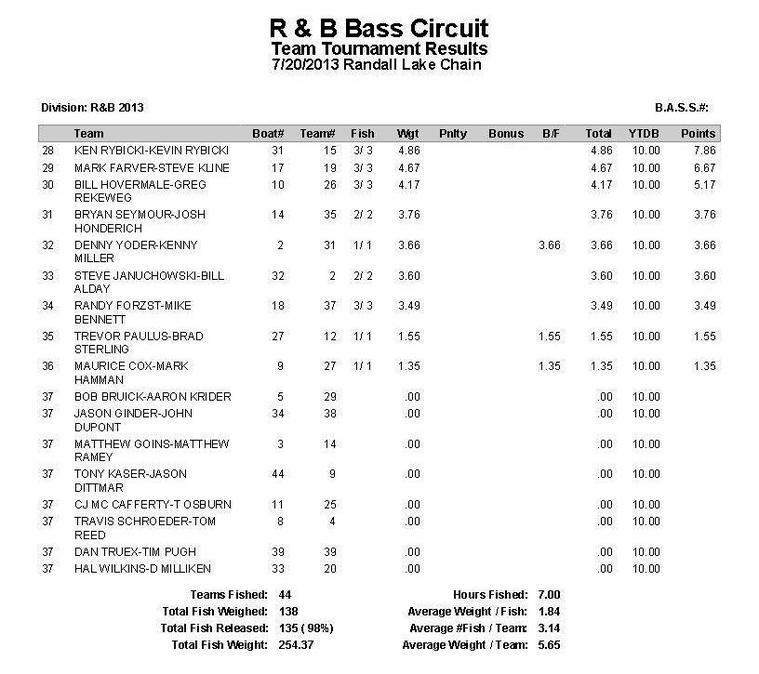 1st Place:Greg Mangus has earned his reputation as one of the premier fishermen on the Randall Chain, and he admits his experiences exceed most, however, he had no confidence going into this event. He swears, “I did not even know if I could catch a limit.” But after his performance Saturday, he will never again be taken seriously if he utters those words; because a limit, he did catch. Nor was not just any limit. It was the second biggest stringer (18.88 pounds) in the R & B books and also the biggest blowout in R & B history! 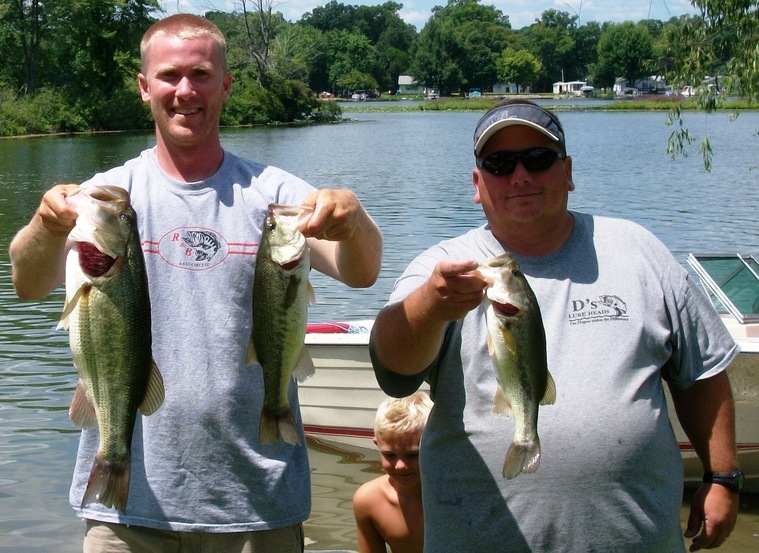 He and Kevin Fletcher won the event by 7.05 pounds. In fairness, it was not just Mangus, he had the good fortune of having Fletcher, a jig expert, along. “Kevin caught a 14 ½ incher at our first spot and I said to him, ‘Bubba, we’re not finishing last!’” he lamented. But this was just the beginning for Fletcher. 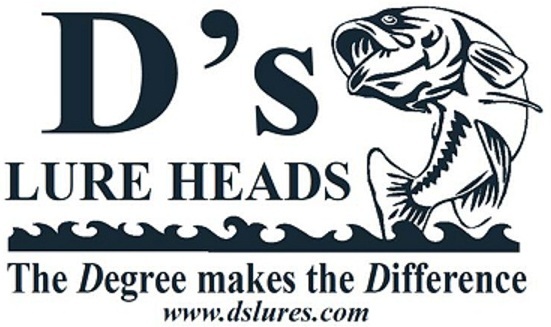 Overall, it was an excellent morning for the Points Leaders as their second spot produced: Mangus landed a 2 ¾ pound largemouth (which happened to be the smallest fish in their bag), and Fletcher landed their biggest bass, a 4.88 pound beast on his next cast. 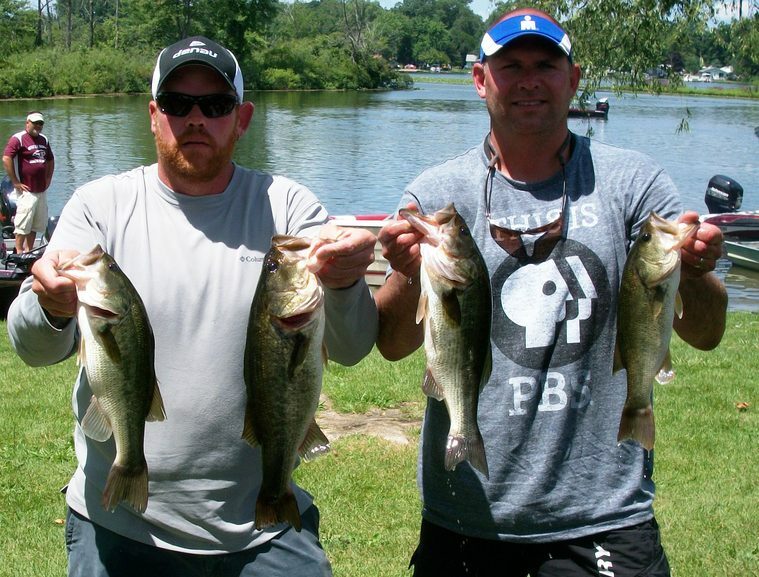 At 8:30, their third stop, Fletcher added another bass over four pounds. But it got tough after that. Mangus recalls, “At noon, we were still stuck on four fish, so we went to the South Lake in hopes of filling out our limit. We did not. The spots we wanted to fish had been sprayed [weeds], and we only got short fish.” Thus the team went back to Randall Lake where Fletcher promptly landed another four pound bass at their first stop. Then with just 30 minutes left, after moving up shallow, Mangus boated another four pounder; this culled out the 14 ½ inch fish. 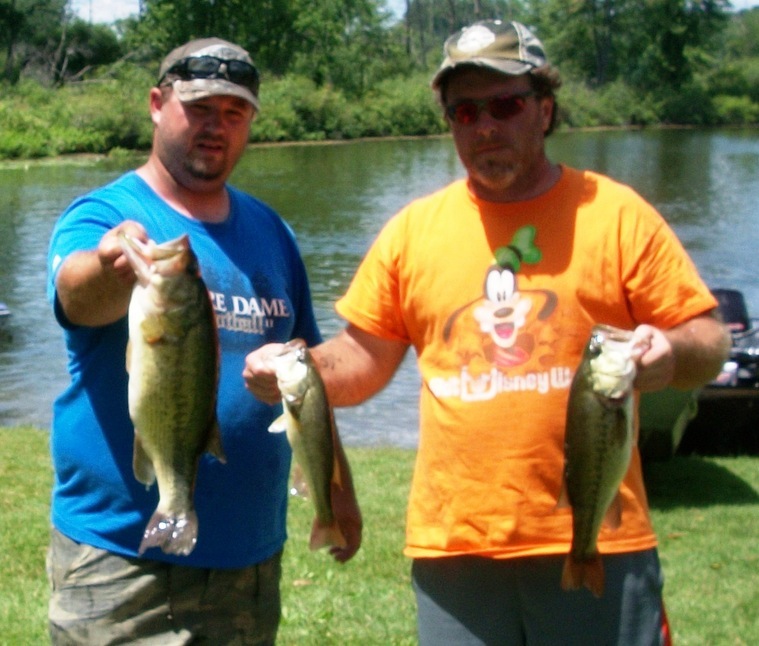 The win awarded them $766 and their big bass, the second heaviest of the day, won them an additional $88. This brought their total winnings to $854. Their names are littered throughout the Records page. 2nd Place:Tom Montague and Aaron Likens soaked a sweet spot and then used some last minute heroics to land an 11.83 pound limit and carry home $464. In practice, they located some heavy weeds on the South Lake that were holding some quality fish, thus they began there Saturday and soaked it for all it was worth. again until it was time to head in.” Their bait of choice, as Montague learned, was important. He claims, “I tossed an array of baits but could not catch a keeper until I switched up to what Aaron was throwing.” That bait was a green pumpkin Reins Hog flipping bait matched up with a ½ ounce Reins tungsten bullet weight. The bait was complemented with a 5/0 TroKar flipping hook. Not knowing how long it would take to get back to the ramp due to boat traffic, the team began their trek back to the ramp with an hour remaining and arrived with 30 minutes left. Not wanting to waste time, they began flipping the pads around the ramp. On his last cast, with boats circling and loading on their trailers, Likens hooked into and landed a 17 inch fish for a vital cull! 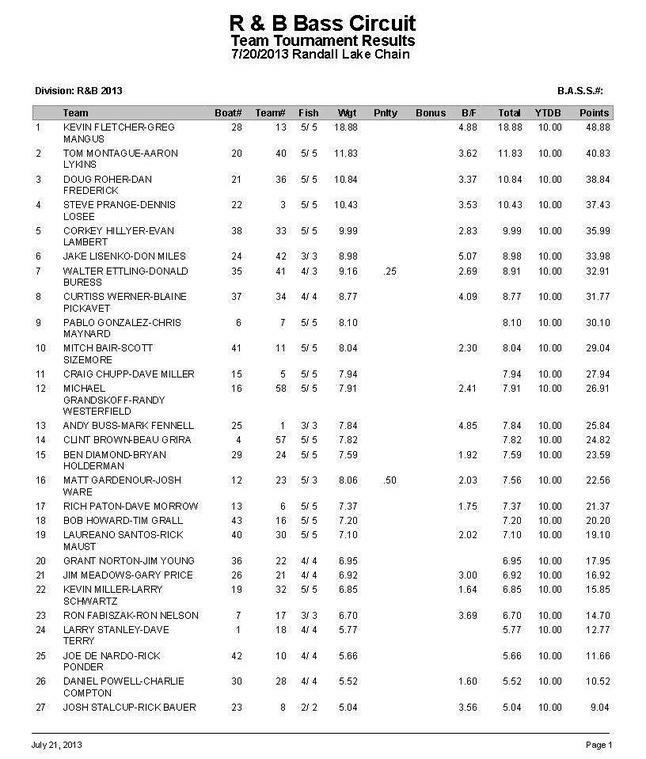 The high finish catapulted them from 23rd place in the Standings to 11th place. 3rd Place: The reputation of Doug Roher and Dan Frederick is that they fish for the big bite with no regard to season points. Often they throw fish back instead of weighing them if they feel they cannot win a check. Roher admits, “I gun for the big fish of the tournament. If I catch some fish, they are normally pretty good.” Their style has been on display this season in the R & B Bass Circuit. They have struggled, but it came together at Randall. Early in the day, they tossed topwater baits in and around emergent vegetation and scored several keepers. However this bite dried up mid-morning. They responded by working jigs through the same type of cover. 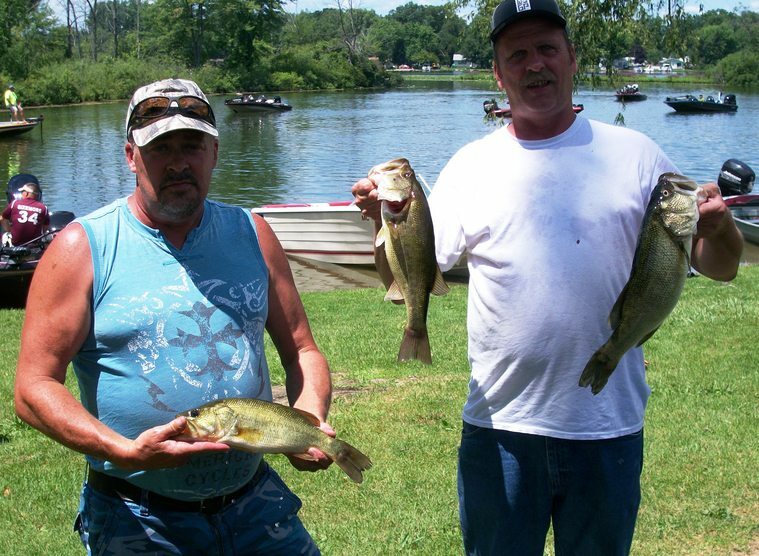 Their best five fish weighed 10.84 pounds, which won them $348. 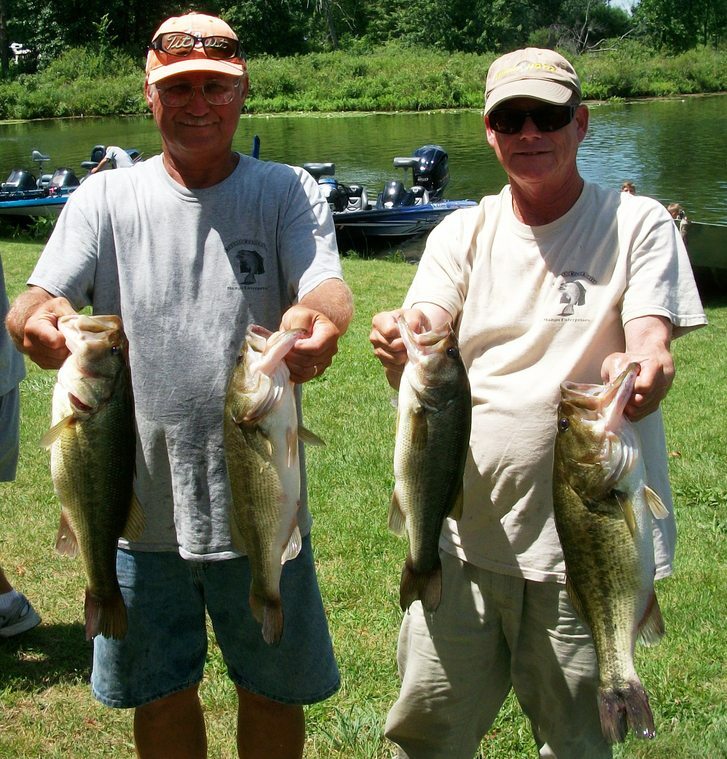 4th Place:The great guys that check the livewells in the morning, Steve Prange and Dennis Losee, also went to South Lake to exploit a flipping pattern they too discovered in practice. But, while this technique only produced one keeper on tournament day, they still managed to scrounge up a Top 5 finish, their sixth, and only three teams have more. 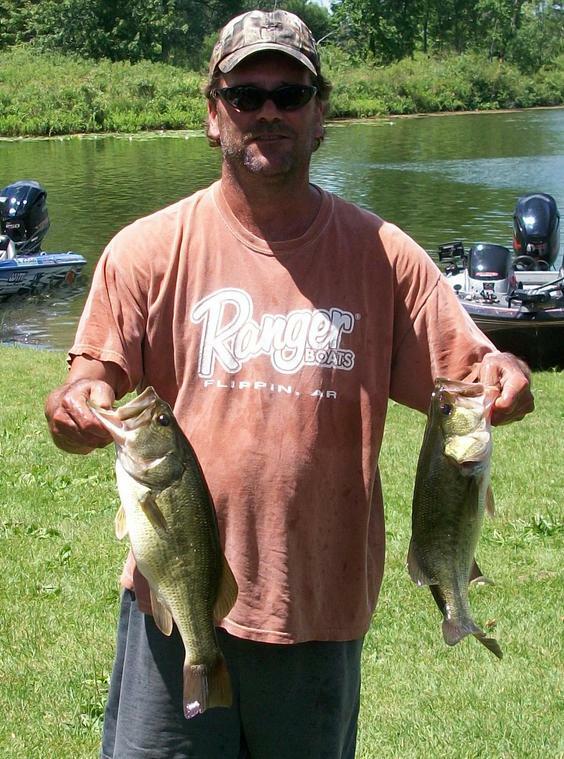 pound largemouth.” But this fish came on a Zoom Fluke, and he followed it up with another. In fact, the team only caught one keeper by flipping a jig. Their remaining keepers fell for a senko rigged Texas. Their success was the epitome of junk fishing and maximizing the opportunities that came their way. AS they cruised through South and Messenger Lakes, they adjusted from spot to spot. The 10.43 pound limit won the veterans $232. How did this lead to success? “Since we had nothing we were confident in,” Hillyer elaborates, “at take off, we just put the trolling motor down and began fishing Craig Lake.” In a matter of minutes they began catching fish, including keepers on a both watermelon colored tubes and jerkbaits by working the weedline. Overall, they caught three keepers on the jerkbait and six on the tube. A final bass fell victim to an artificial frog. 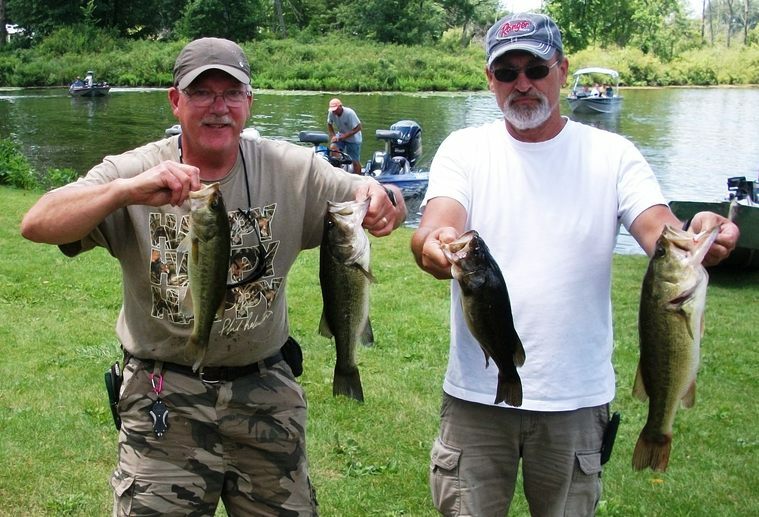 They noted that the fish were relating heavily to the weeds, and anytime their baits were not in contact with weeds, the hooks came back empty. 6th Place & Money Mouth Baits Big Bass: Just 30 minutes into the tournament, Jake Lisenko and Don Miles tossed out a Senko bait on a steep breakline and a 5.07 pound largemouth engulfed it. The big fish won them $352 while their limit of 8.98 pounds won them an additional $160, making their day's earning $490. 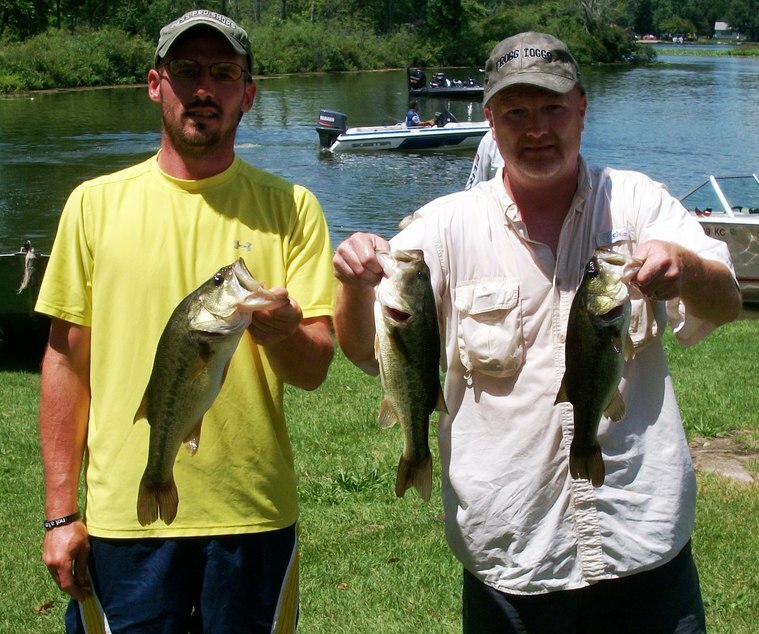 7th Place: An 8.91 pound limit earned Donald Buress and Walter Etling (left) $116. 8th Place:Blaine Pickavett and substitute partner Kris Thornton bagged a 8.77 limit to win $92. D's Lures Award: The 8.10 pound limit of largemouth won the team of Chris Maynard and Pablo Gonzalez a tackle pack and shirts from D's Lures. C Flash Crankbaits Big Bass: Tournament Directors Andy Buss and Mark Fennell landed a 4.85 pound largemouth to win a tackle pack supplied by C Flash Crankbaits. Starboard Choice Marine Challenge:Mitch Bair and Scott Sizemore finished tenth place with an 8.04 pound limit to earn $200 in gift certificates from Starboard Choice Marine. Unfortunately, they were not qualified because their boat was absent of the necessary sticker. Thus, the challenge will be worth $300 at Austin Lake. Solar Bat Sunglasses Incentive Money:Laureano Santos and Rick Maust finished 19th place and are eligible to have their next entry fee paid by Solar Bats.